England's Jonny Bairstow celebrates his century fat Headingley yesterday. IT is great to see Jonny Bairstow bat like he did for England and take the game to Sri Lanka in the Test at Headingley and I am glad he played like that – that is how he has been playing at Yorkshire and what has brought him success. When he comes out at number seven for England, he can be attacking and change the course of a game like he did and change the momentum and I thought he was outstanding. Over time, I think that Jonny will work his way up the England order. But at this moment in time, I think seven is perfect for him. He is still finding his feet with the gloves and there’s not as much pressure as seven. If you have Ben Stokes at six and Jonny at seven, those two are really positive players who can take the game away from you. So for me, at the minute, seven is nice for him. Although I think eventually he will end up at five or six. Looking at Jonny and the way he is now flourishing in the Test arena, people speak about how things have changed for him. For me, I don’t think he has changed that much technically, although he has tightened his game up as you do when you get older and work things out. He probably just feels now like he belongs a bit more at this level. He has improved and now knows he can do it. I know myself that when you first make a step up, you wonder if you are good enough – like you do when you first come into county cricket. Then you make a score and begin to believe in yourself. I think that’s what has happened with Jonny at Test level. That South African trip for him was a big plus and has given him the confidence that he belongs at this level. Back to this current Test and it is a typical Headingley pitch, although probably a bit slower than England’s seamers would have liked. They would maybe have liked a bit more pace in it. There was a little bit of grass on it and Thursday was a bit damp and overcast and as a batsman, it is about working hard to get past the new ball and those first 30 overs. But to be fair to Sri Lanka, I thought they bowled really well and controlled the run rate. When you do that, you have every chance of getting a few out and you are ahead of the game. Alex Hales did well and for me, he is really developing into a good opener and I saw a change in him when we played them at Trent Bridge. He was very watchful. He’s not a dasher – far from that – and he has a solid technique and is a lot tighter than he was. He can be a really good opener. 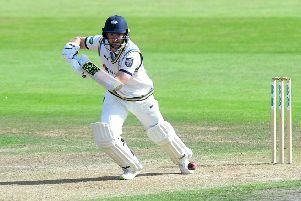 Onto Yorkshire and while we got away with a draw at Somerset, we are not playing as well as we would like at the minute. That was typified by how we played at Taunton. It had been a while since we followed on as a team. But we decided as a team that our best way to win was to bowl first and on that first day, we just didn’t bowl well at all and hit our straps. Scoreboard pressure when they have got 550 on the board means you have to bat a long time. The key thing is that although we aren’t playing well, we are still picking points up and results up. We were in a similar position last year three or four games in where we had only won one game and then we went on a run. We have to believe now that we can play a good, solid brand of cricket that we know we can and get some consistency. There’s a few players out of form – me included. I have not scored the runs I would have liked and usually do and like to lead from the front. It’s not down to a lack of work ethic and there’s a lot of lads who are working really hard. If you put the hours in, you have got to believe it will change at some point. Although for us, the break from the County Championship now comes at a perfect time after five weeks of going at it with only one day off a week – and we have spent quite a lot of time in the field as well. It will be good to get away, recharge the batteries and come back with a fresh mind and body.